If you think you have a virus or malware infection, and you are having trouble identifying and removing it then you may have been infected with a ‘Rootkit’. A Rootkit is a very nasty kind of virus that uses some very devious cloaking techniques to hide itself from both the Operating System, and ‘normal’ malware scanning products. The only way to get rid of a Rootkit is to use a specially created removal program – fortunately Kaspersky Labs have produced such a program, and have made it freely available to download by all. 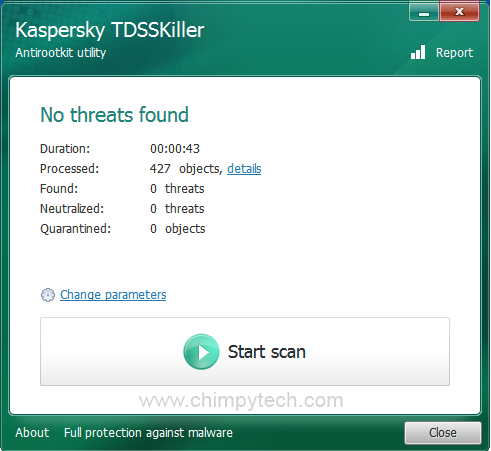 Once you have downloaded TDSSKiller, simply double click on the downloaded file and accept the license agreement to begin using it. Note – TDSSKiller doesn’t need to be installed, it will simply run in standalone mode. 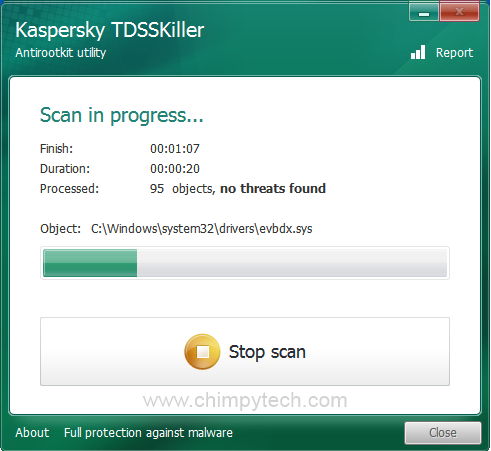 Once you have accepted the license agreement, you will see the main TDSSKiller screen below – simply click the ‘Start Scan‘ button to get your scan under way. Whilst the scan is going you will see the screen below, showing the progress of the scan, including the number of files scanned, and the amount of time taken. Once your scan is complete we would hope that you see a screen like the one below, showing you that everything is fine, and that TDSSKiller couldn’t detect any Rootkits on your system. What Happens If TDSSKiller Finds An Infection? Unfortunately there are going to be times when you may well find that TDSSKiller finds something nasty on your system. You will see a screen like the one below, simply follow the instructions on the screen and TDSSkiller will attempt to remove the problem as best as it can. You will usually need to perform a reboot to complete the cleaning process, so make sure you do this straight away.